After his release in January, he took 12 paintings home and five pastel works are now on display at the exhibition. Most of the pictures are a reflection of conditions which the artists had to endure during their imprisonments, while others are inspired by missing loved ones. 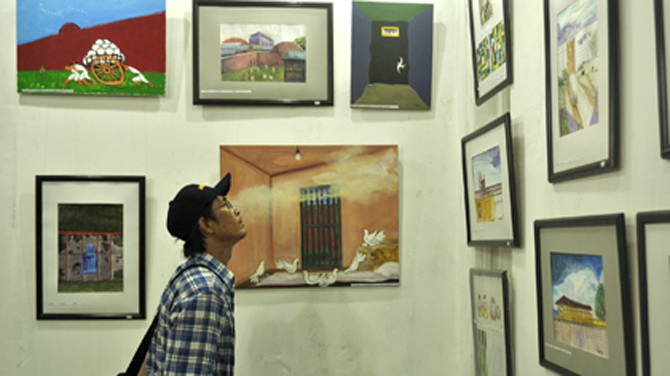 At the exhibition venue on Saturday afternoon, a woman in her late 20s stood still, fixing her eyes at a painting that depicts a downcast figure in prison uniform squatting in his cell with a guard tower in the background. A man a few meters away captured a pencil portrait of a young girl entitled “My Daughter” on his iPad. In one corner of the hall, a Buddhist monk was immersed in reading an inmate's personal correspondence that had been turned into a collage. But, to some admirers' dismay, most of the paintings were not for sale as they represent a poignant time of the artists' lives, said Sanny. Ian Holliday, a professor from Hong Kong University and a scholar on Burmese politics, was one of the audience members who wanted to buy a painting by Min Ko Naing. The organizers said they would sell duplicates of the paintings on the last day of the show to compensate those disappointed by the not-for-sale policy. "I understand their feelings. Of course, creations during their prison terms mean a lot to the artists. This exhibition shows political activists who have endured hardships can also create art,” said a woman after offering to buy the Suu Kyi portrait collage. When asked if she would reveal her identity, she replied, “I can't tell you that much because I'm a government official.” And then she left the Amnesty Prison Art Show 2012 venue.